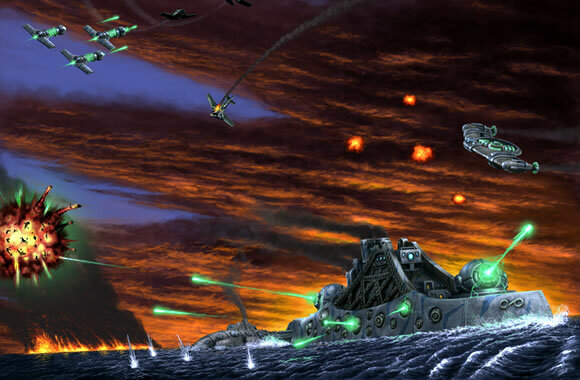 First contact with enemy forces reported by War Fleet Strabonis. The fleet sent out a small forward element to sail the regions surround the Falkland Islands in preparation for a large push to liberate the islands. They were intercepted by a Prussian force which appeared to be preforming a similar action. The Covenant forces were pushed back with heavy losses to the element including one Aristotle Class Battleship. The rest of the War Fleet has been placed on high alert and plans in the Falklands have been stepped up. Went round to Ben's last night to get my first game of Dystopian Wars in. Snorri lent me the rule book which I have read through a few times now and have got my head round the basics for the most part. I, however, still need to read all the updates from the PDF's on-line to see what changes have been made as I am aware a few major sections are now different, for example the tiny flyers rules. Was a good experience, it taught me a lot about unit placement and also started me on the road to learning how my units work and some of their strengths and weaknesses. Well at least when it comes to fighting Prussia. It also proved my initial suspicion that energy turrets really are rather nice. Replace primary weapons with secondary weapons that have the same AD across all bands. This of course meaning I can link my main turrets with the broadsides and such. They really make the standard Plato Cruisers rather nice. Thanks Ben for having me round and for the game, I look forward to the next one! I will liberate those islands sir... you just wait! Ill be back with re-enforcements and a (hopefully) better plan! All in all a great game, glad I got my self a force, and it was a refreshing change to Games Workshop games which are all I have played before. Shall definitely be getting my land air and sea forces up and running to a decent size as soon as possible.